The annual British royal Easter parade took place on Sunday morning at St. George's Chapel, Windsor. 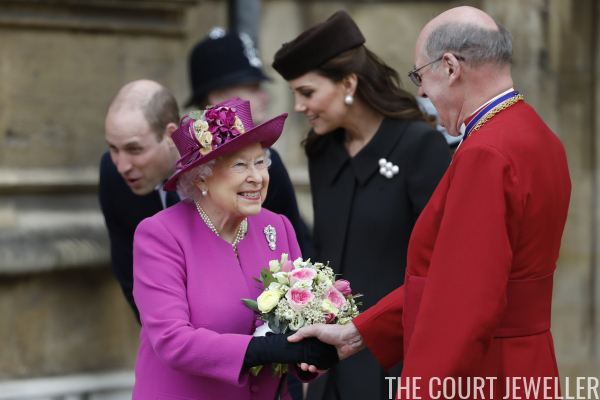 Here's a look at the jewels that the ladies wore with their Easter bonnets! 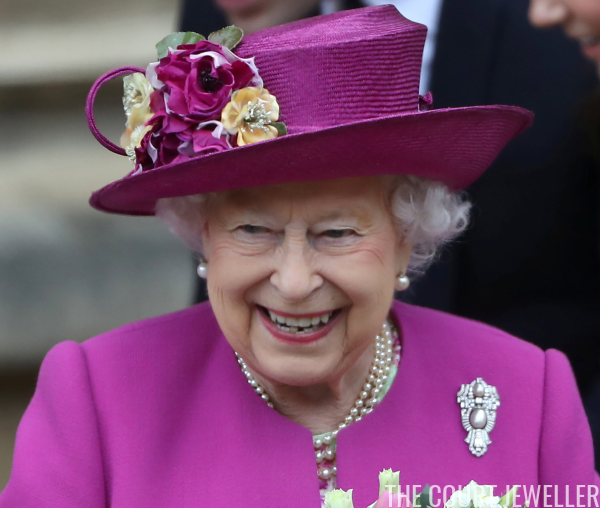 The Queen may have gone without a brooch for the Royal Maundy Service, but for Easter Matins, she chose an old favorite: the Pearl Triangle Brooch, which is set with two pearls and a yellow diamond. 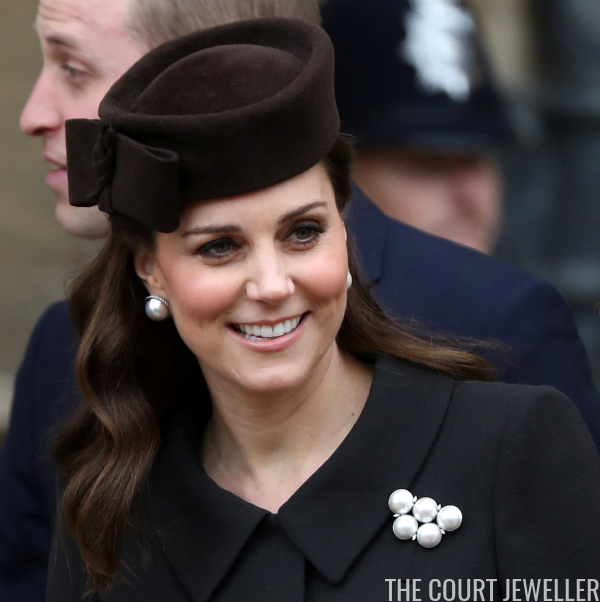 The Duchess of Cambridge selected pieces from her collection of mabe pearl-style jewels: the earrings, which are by Balenciaga, and the brooch. 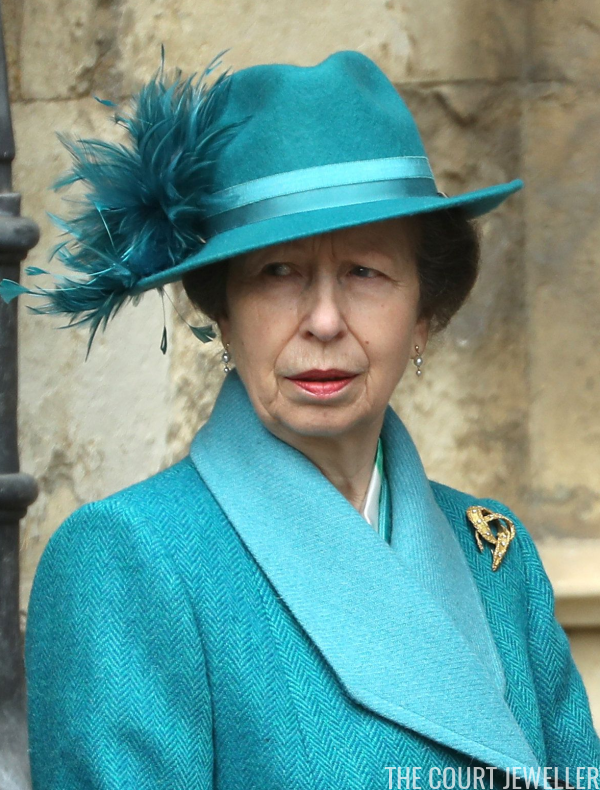 The Princess Royal chose pearl earrings and her modern diamond-studded gold ribbon brooch. Anne's daughter, Zara Tindall, and her daughter-in-law, Autumn Phillips, were also on hand for the Sunday service. Autumn wore classic pearl and diamond earrings with a delicate bracelet, while Zara wore sparkling stud earrings with rings, including a band on her right hand. The York princesses were present as well. 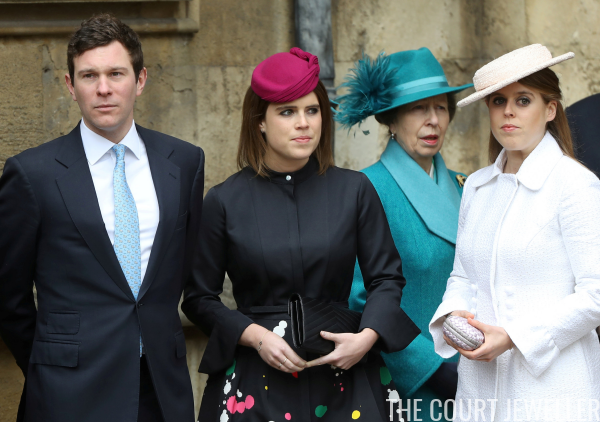 Princess Beatrice, as usual, went without jewels. (What jewels would you have worn with her outfit?) Princess Eugenie wore hoop earrings and her fabulous sapphire engagement ring. She also brought her husband-to-be, Jack Brooksbank. Delicate jewels were the order of the day for the Wessex ladies. Both wore delicate pendant necklaces; Sophie's features an initial charm.